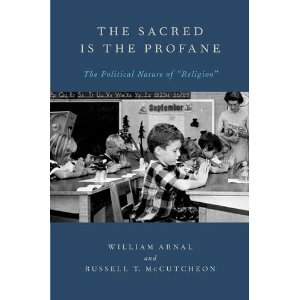 This October, Oxford University Press will publish The Sacred is the Profane: The Political Nature of “Religion” by William Arnal (University of Regina) and Russell T. McCutcheon (University of Alabama). The publisher’s description follows. The Sacred Is the Profane collects nine essays written over several years by William Arnal and Russell McCutcheon, specialists in two very different areas of the field (one, a scholar of Christian origins and the other working on the history of the modern study of religion). They share a convergent perspective: not simply that both the category and concept “religion” is a construct, something that we cannot assume to be “natural” or universal, but also that the ability to think and act “religiously” is, quite specifically, a modern, political category in its origins and effects, the mere by-product of modern secularism. These collected essays, substantially rewritten for this volume, advance current scholarly debates on secularism-debates which, the authors argue, insufficiently theorize the sacred/secular, church/state, and private/public binaries by presupposing religion (often under the guise of such terms as “religiosity,” “faith,” or “spirituality”) to historically precede the nation-state. The essays return, again and again, to the question of what “religion”–word and concept–accomplishes, now, for those who employ it, whether at the popular, political, or scholarly level. The focus here for two writers from seemingly different fields is on the efficacy, costs, and the tactical work carried out by dividing the world between religious and political, church and state, sacred and profane. As the essays make clear, this is no simple matter. Part of the reason for the incoherence and at the same time the stubborn persistence of both the word and idea of “religion” is precisely its multi-faceted nature, its plurality, its amenability to multiple and often self-contradictory uses. Offering an argument that builds as they are read, these papers explore these uses, including the work done by positing a human orientation to “religion,” the political investment in both the idea of religion and the academic study of religion, and the ways in which the field of religious studies works to shape, and stumbles against, its animating conception.